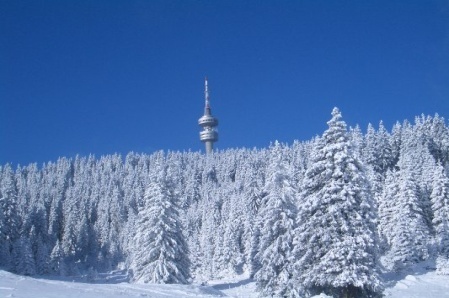 Situated high in the Rhodope Mountains in Southern Bulgaria, Pamporovo is set against the magnificent backdrop of the Rhodopi Mountains and is the perfect Winter Holiday destination with its quality ski and snowboard instruction, great selection of après ski bars and high standards of accommodation. Hit the slopes of this beautiful purpose built resort which has a wide variety of pistes to keep all abilities happy, Holidays to Pamporovo though are ideally suited for beginners and intermediates. The Pamporovo Ski School is internationally renowned, and the ski school is where many Balkan Holidays clients have had their first ski or snowboard experience. Pamporovo also has the added attraction of night skiing. Pamporovo has seen numerous improvements made to its ski facilities. These include new 4 and 5 star hotels and apartments, two new ski runs, as well as a new high-speed four man chair lift. Pamporovo also has an efficient bus service operating between the main ski area and the centre of the resort, though most hotels have their own shuttle buses to the ski area. After a day on the slopes, you can take advantage of the après-ski in Pamporovo which is fun and inexpensive with lively bars and discos. For those wanting to sample traditional Bulgarian food why not head to one of the traditional restaurants to try the local specialities accompanied by some popular Bulgarian wine. Balkan Holidays Representatives in Pamporovo organise a special folklore evening where you can taste and sample local specialities. Your Balkan Holidays Representative in Pamporovo has an exciting Après Ski Programme for you to enjoy and a great chance to mix and mingle with all the other skiers and boarders and share your experiences. You will be met by your Balkan Holidays Representative the first day after your arrival at the ski depot, and they will issue you with your lift pass and be on hand to help you get your equipment and put into the correct classes. After your first day on the slopes, your Balkan Holidays will hold a Welcome Meeting to give you all the information and handy tips you will need to make the most of your holiday. Most of our Balkan Holidays Representatives are local to the resorts that they work in so you can rely on "first hand" knowledge and expert advice. Many of our reps have also worked as ski and snowboard instructors so going to the Welcome Meeting is an ideal chance to find the best places to go on the mountain. Balkan Holidays has some great offers to Pamporovo for the forthcoming Winter Holiday Season. With Prices for Holidays to Pamporovo starting from £215 and if you book online you get a further 7.5% reduction. Further offers for Holidays to Pamporovo include three free tickets for night skiing when either a six day lift pass or Full Ski or Snowboard Pack is purchased before travelling.